Whenever you have a large number of menu items it is best to use mega menus. The mega menu will help you categorise the menu items and also lets you add images to the menu and give a visual clue about each section. How to use the mega menu? 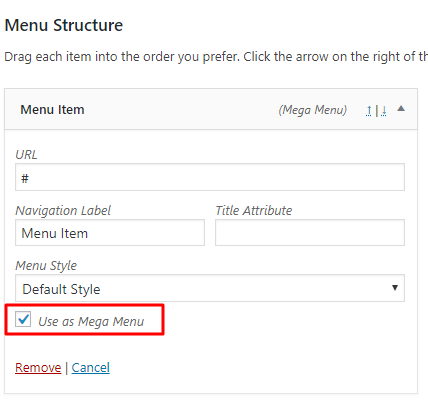 To activate the mega menu expand the menu item and select the “Use as Mega Menu” option. 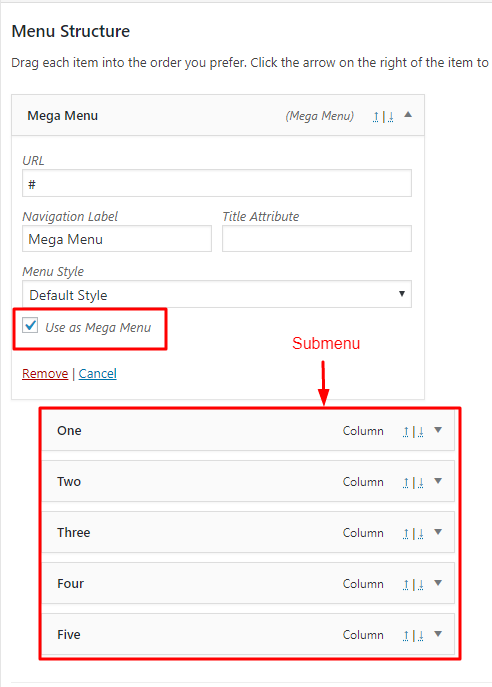 Add submenu items under the menu item which has been selected to use as a Mega Menu. This should give you a basic Mega Menu as seen below. 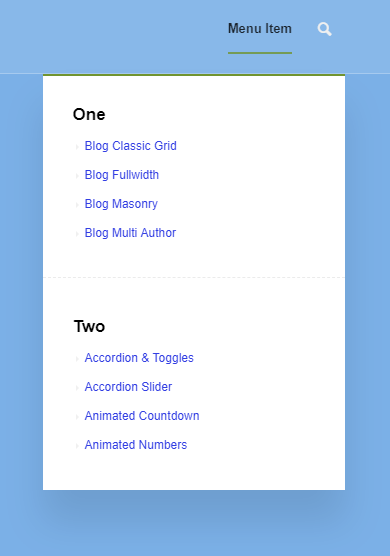 Let’s display the submenu items in two rows say 1 – 3 in the first row and 4 – 6 in the second. 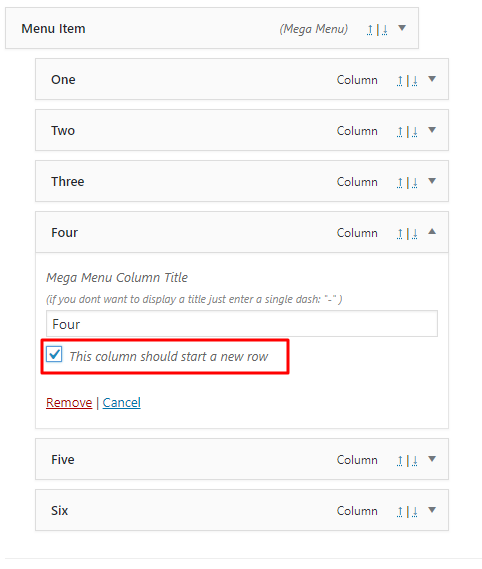 To do so expand the submenu item which need’s to start in a new row and select the option “This column should start in a new row”. We will do that for the fourth menu item. Let’s add more menu items for each of submenu to create a true Mega Menu. To make the mega menu dropdown scrollable please use the CSS below. 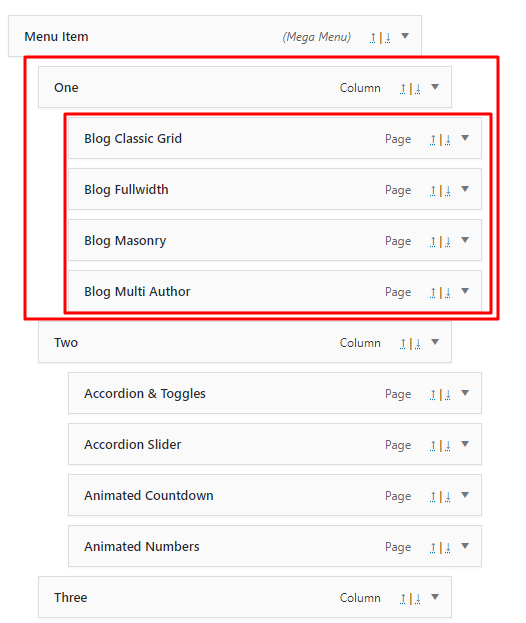 In the below example we will select a blog page and make it a mega menu with different sections and images to visually represent each section. Go to Appearance > Menu Editor. First, let’s add a menu item by selecting an existing page/post or you can even add a “Custom Links” and tick the “Use as Mega Menu” option. 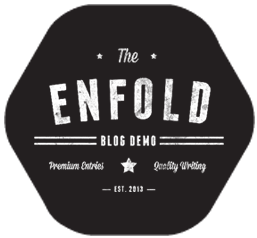 Next step is to add another menu item from the “Custom Link” section and drag it slightly to the right of the “Blog” menu item above it. This will create a hierarchy or a parent-child relationship. Any menu item added under a parent menu item becomes a child menu and automatically appears in the drop-down section. To add a clickable image edit the child menu URL and Navigation Label. Change the “URL” to a prefered link and in place of the “Link Text” add the HTML code for the image. 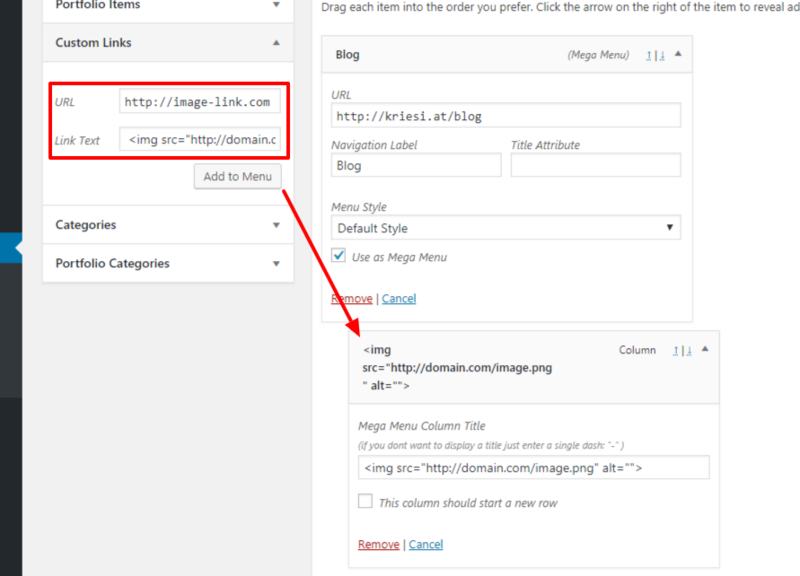 To add an image that is not clickable we need to repeat the previous step so we can make use of the submenu description field to add our image. Add another menu item from the “Custom Link” section and drag it slightly to the right of the previous child menu we added. Add a “-” in the “Link text” area and the HTML image code in the description area as shown in the below image. 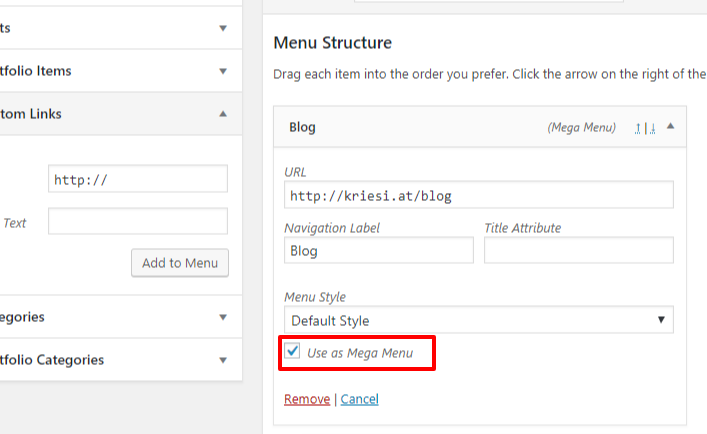 (A “-” is necessary if not WordPress will delete menu items with empty labels). Lastly, you need to check the “Use the description to create a Text Block. Don’t display this item as a link. 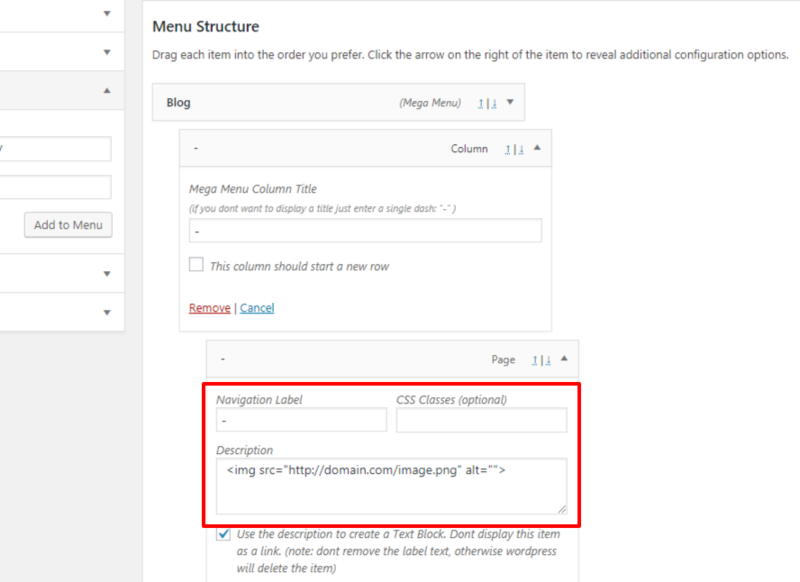 (note: don’t remove the label text, otherwise, wordpress will delete the item)” option. Having trouble with the mega menu options or the way it appears on the frontend? The first thing to check is if any plugin is having a conflict. We have had issues with plugins like Popup Maker. 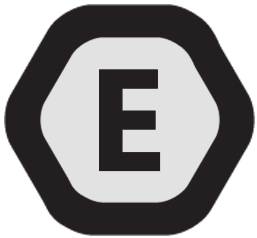 For testing purpose deactivate all the plugin and see if the issue persist. If the problem exists only when the plugin is active please perform the below steps. Go to the Popup Maker plugin’s Settings > Misc panel then tick the “Disable Popups Menu Editor” option. And lastly, add the below code at the end of the functions.php file.